Drought conditions in the upper Midwest are causing major concerns for companies that ship goods and materials on the Mississippi River. Local carriers are keeping an eye on how low water levels between Saint Louis and Cairo, Illinois (where the Ohio and Mississippi meet) could affect their supply routes. Mike Toohey is president of the Waterways Council, a carrier trade and policy organization. “It’s a concern of supply and it is similarly for those that ship from the Ohio River up the Mississippi, the ability to get to your customers is challenged by this declining water,” he says. Kendra Overbeck is with Valvoline's Covington office, which receives shipments that come up from Houston. “Our Valvoline team is monitoring the river levels here in Cincinnati and nationally and, at this time, there is no local impact,” she says. 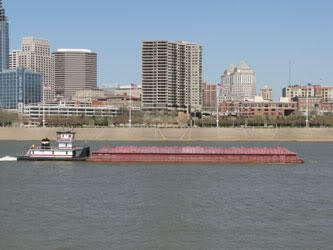 Rick Calhoun is President of Cargill's barge business, which ships grain, salt and other bulk items through Cincinnati. “The Ohio (River), today, is functioning well. The lower Mississippi where the Ohio connects into the Mississippi has been blessed with some reasonable rainfalls over the past month or so and the water levels there are fine and the river is operating fairly well,” he says. Companies got some good news late last week. The Army Corps of Engineers says it's making good progress breaking up some rock problems. That, along with some expected rainfall, means the Corps should be able to keep the Mississippi open through the end of the January.